Please refer to the Appendices for the instructions applicable to your specific type of gateway. This step is only required if you have not entered your gateways into the system before. In this case, you must enter your gateways as nodes. PortaBilling® requires some key information about your network equipment such as IP address, Node ID, Radius shared secret, etc. 1. 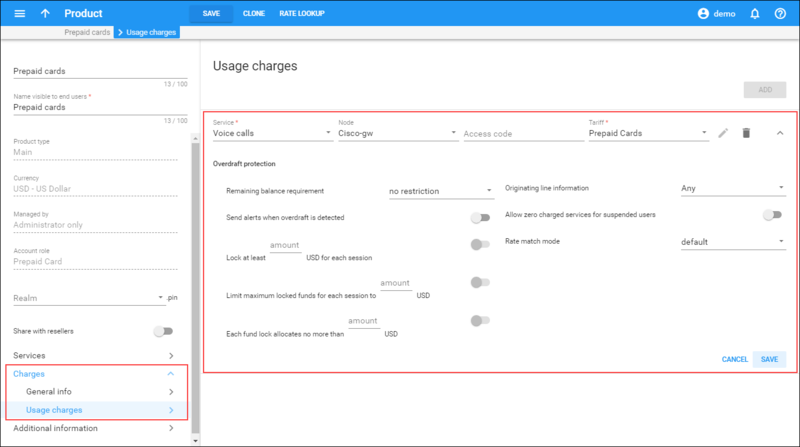 On the navigation menu, select Infrastructure, then Billing data sources, and click Nodes. · Name – Type a short descriptive name for your SIP server (that will be used in the lists). · Node ID – h323-id (recommended format: hostname.domainname). · IP – IP address of the gateway. · Manufacturer – Select Cisco or Quintum. · Type – VoIP node type. Select VOIP-GW. · Client protocol – Select RADIUS to enable the gateway (node) to communicate with PortaBilling® via RADIUS in order to validate the prepaid card PIN. · Radius key – Enter the RADIUS secret key you have specified in the configuration of the gateway. 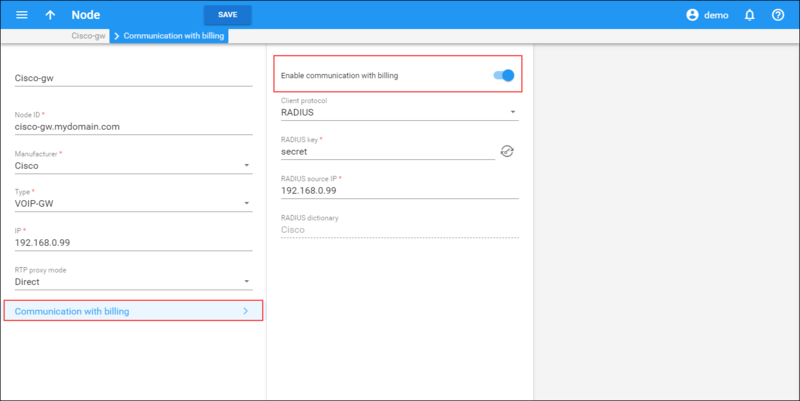 · Radius source IP – See the Node ID, IP and Radius source IP section of the PortaBilling Administrator Guide. Unless your gateway has multiple network interfaces, the value here should be the same as IP. 6. Repeat steps 2–5 until all of your nodes have been entered. 2. 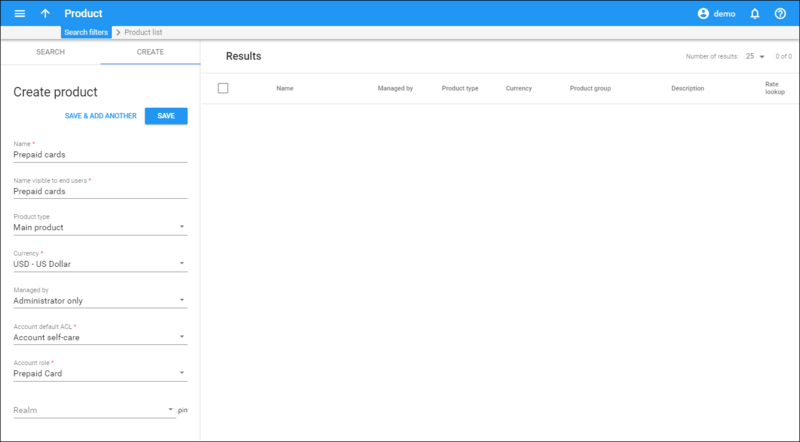 On the Create product panel, fill in the product details and add the services. Please refer to the Create Product chapter of the Basic Residential VoIP Service section for a detailed description of the product creation process. 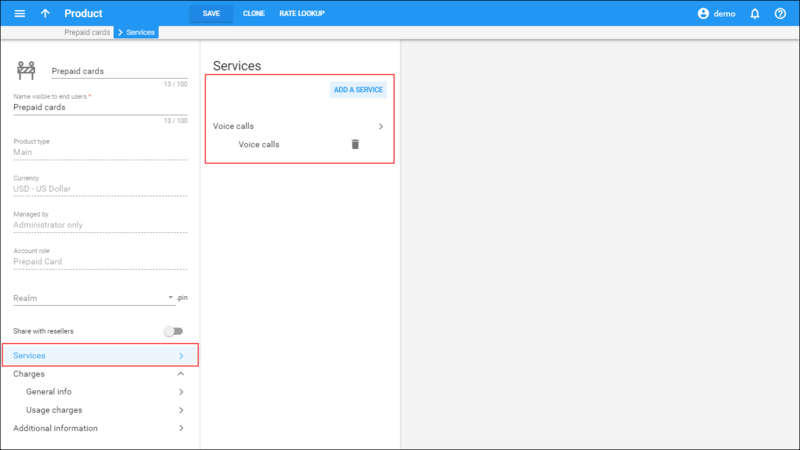 · Node – Select the node where your IVR will be running. · Access code - You can also use an access number for rating entry. For example, if you have a node with two access numbers, local (1-212-1234567) and toll-free (1-800-12345678), you can set up the product’s rating list in such a way that if a customer calls via a toll-free line, he will be billed using a different tariff (one which includes surcharges). NOTE: The Access code feature requires modification of Cisco platform application scripts. For more information about this feature, see the System Concepts section of the PortaBilling Administrator Guide. The Access Code feature on the Quintum platform requires the ACCESSCODE feature (available in the recent firmware). · Tariff – Select the tariff that will be applied to your prepaid calling card customers. 2. 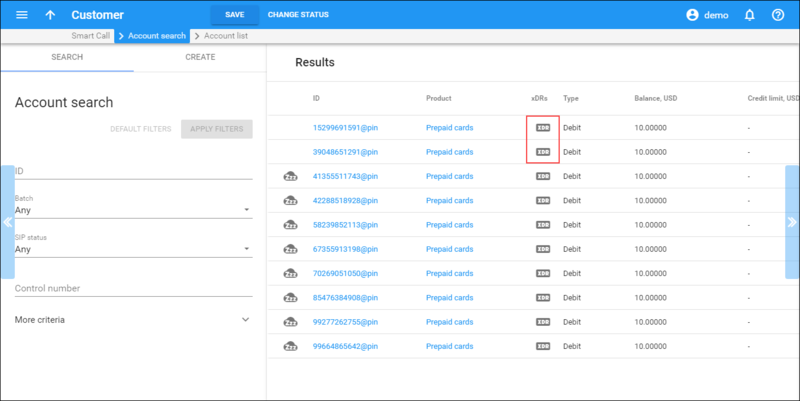 On the Create customer panel, fill in the customer details. Please refer to the Create a Customer chapter of the Basic Residential VoIP Service section for a detailed description of the available parameters. 3. 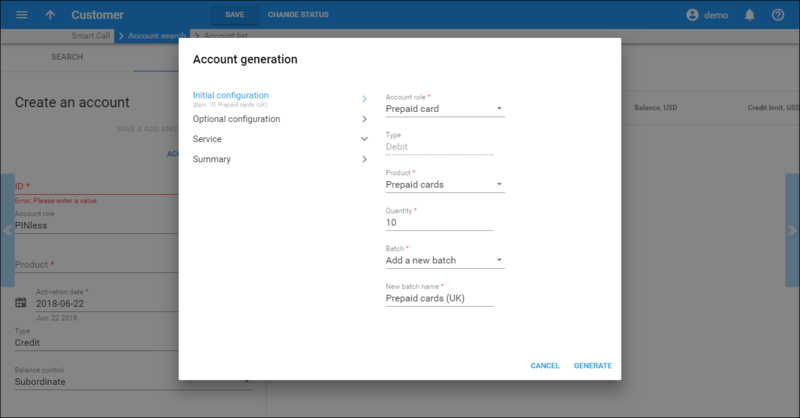 In the Account generation dialog, fill in information about accounts (please refer to the Generate Accounts chapter of the Prepaid Calling Cards handbook for a detailed description of the available parameters). NOTE: Account generation tasks are executed every few minutes, and it may take a while to generate large numbers of accounts. Notification about the generated cards will be sent by email to the user who created them. A .csv file with information about the new accounts will be attached. In case the original email message was lost or accidentally deleted, the file containing generated accounts is stored on the slave PortaBilling® server in the user /porta_var/<Server_IP>/ directory, sub-directory cards. 1. Start Radius debug on GW. 2. Try to make a call and use one of the accounts. 3. Browse information using Log Viewer. 1. 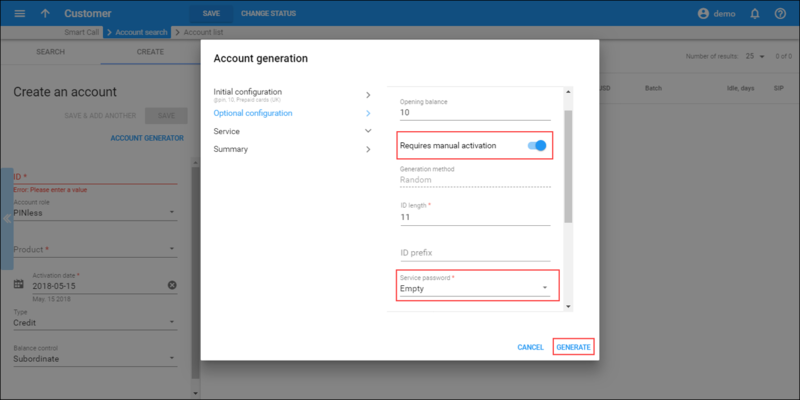 To view the xDR of an account, go to Customers, select the Customer owning the accounts, and open the Accounts panel; or, alternatively, on the navigation menu to the left, select Toolbox and click Find account. You can also go to the account self-care page (accessible via the Accounts menu item in the Home popup menu). The only difference is that account’s owner does not have the option of seeing incomplete (failed) calls when using the self-care interfaces. Login with the account’s web access login and password. After that you will be able to see the account’s dashboard interface. On the Billing Information tab, click Transactions. Choose the date range for which you want to see a list of calls, and click Show Records. In the results table you will see call charges and other fees, such as maintenance fees or refunds (if any). The report can be also downloaded by clicking the Download icon. If you want to see a list of all calls going through the system, or perhaps only those for a particular destination, use the Trace Session. 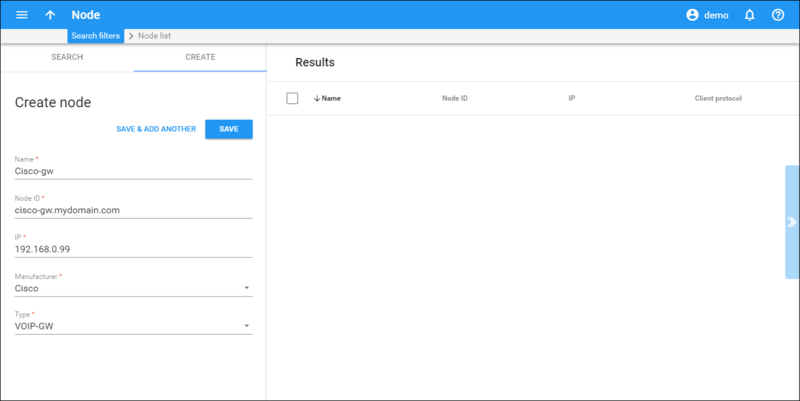 · On the navigation menu, select Toolbox, then select Trace session. · On the Search session panel, specify the Time interval and Service type search criteria. To narrow the call log search, extend the search query by enabling additional filters and defining their values. · Click Apply filters to produce the call attempts list. The advantage of this method is that you can see all call attempts, including unsuccessful calls, with disconnect reasons displayed. Also, you can see the billing history for a call. For the administrator’s convenience, account xDRs can be also reached from the Account list panel by clicking the xDRs icon for an account. Radius debug on GW shows requests, but PortaBilling® Radius debug does not. 1. Wrong radius server IP configuration in GW. Verify and correct. 2. Wrong radius port(s) configuration in GW. Verify and correct. 3. IP network problems. Verify that your network is configured correctly, including cables and firewalls. PortaBilling® Radius debug shows requests arriving but says “request from unknown client”. Verify and correct Node IP address in PortaBilling®. Consider any propagation delay, which may require 15 minutes. Arriving PortaBilling® Radius debug showing requests displays a “failed to decrypt” message. Verify if PortaBilling® Node Radius key configuration is the same as GW radius key (shared secret). PortaBilling® replies with authentication reject. Verify product rating list and account status. Debug session looks normal but GW hangs up (or says nothing) after receiving authentication confirmation. The most common reason for this is the lack of a particular prompt on IVR prompt servers. This situation may occur only for specific monetary or time values. Account balance not decreased after successful call, and call does not appear in call history. Verify that the GW is transmitting stop accounting records. Set accountingtype 2 for Quintum or gw-accounting h323 vsa for Cisco. Deploying prepaid card products with roaming is easy with PortaBilling®. Just install additional gateways in different geographical locations and enter the corresponding nodes in PortaBilling®. Then create tariffs which reflect your service charges for different geographical locations, and extend the product rating list using new nodes and tariffs.